The political expert appeared on the news programme on Friday to discuss the South Korean president's impeachment. 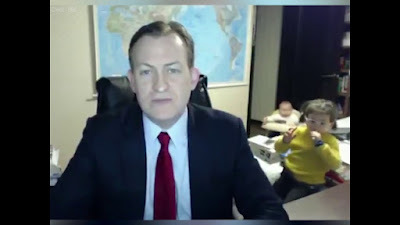 His interview was taking place via webcam as he sat in his study at home. The hilarious footage shows expert Robert Kelly, an associate professor of Political Science at Pusan National University in Busan, handling serious questions on the country's president, Park Geun-hye, being ousted from power. But suddenly, a toddler bursts into the room in a bright yellow top and performs a comical dance behind the Cleveland, Ohio, native.